Screen Magic - Stay In Touch: Salesforce.com: Much Needed 2-Way SMS App. Salesforce.com has emerged as one of the most successful On Demand CRM. It connects the Organization beautifully to its customer base. However, as the Market is growing bigger and the personalized Customer Relationship Management is a high time “YES I NEED IT” requirement. Getting in touch with customers in simple yet most personalized way is need of the moment. With everybody going Mobile, SMS gives exactly the solution to current scenario. SMS solution not only provide a media to communicate with the Customers but also internally and Personally. 1.Send and Receive Updates/Notifications/Alerts inside your CRM. 5.Create/Edit/Configure SMS Templates: No need to type in SMS every-time, just click and find your template (which will use fields from CRM itself) and Let the information flow. 6.Brand your SMS and give it a personalized touch. 9.In addition, SMS CRM enables you to keep a complete record of all SMS communication with your customers, which can assist in creating a valuable database of your customers' details. 10.Wouldn't you like your Calender on your CRM to alerts you about any approaching event ? Doesn't it makes your life look simpler?? A 2 way messaging system, enable the CRM to be more communicative and simple to use. (That’s what I think is the basic Idea of a CRM: Communication and Database). You get connected to your customers/workforce and Communicate. 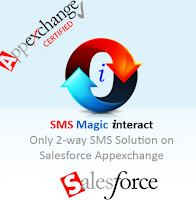 SMS Magic Interact is one such application on Salesforce.com. Its Sweet, Its Simple and most importantly it makes you smile. Thanks, We are adding more functionality and working on better User Experience..If you have any tips or Ideas, do share with us..